Second piece I have commissioned from Retro Steamworks and very cool. Functional and as promised. Delivered on time for a birthday which was a little rushed. Thanks Jay! If you are looking for unique lighting for your home, look no further! This light will be perfect for your desk area, home office, or wherever you'd like to place it. This beautiful piece will be assembled from scratch, all parts are going to be custom finished to your specifications if required. 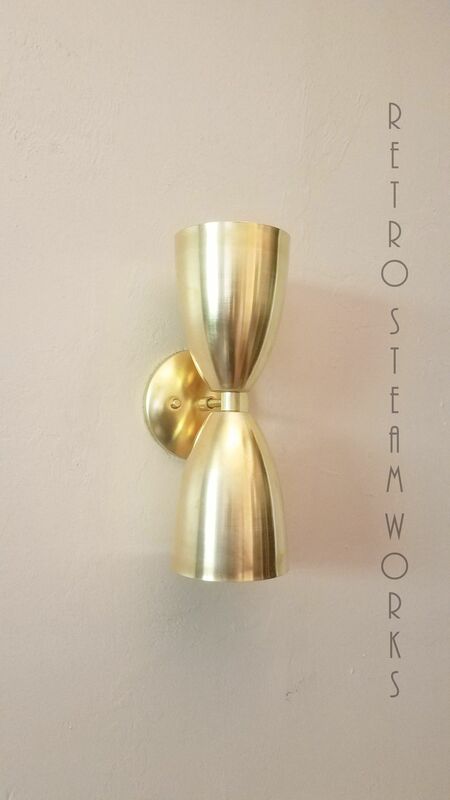 All parts are made of raw brass, two finishes to choose from (use drop-down menu). 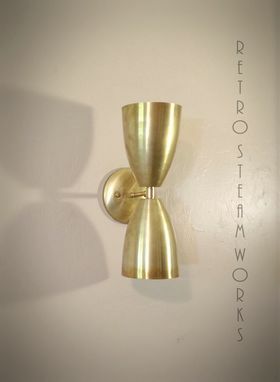 The shades measure 4-1/2" W X 6-1/4" L and the backplate is 5" in diameter. All the wiring and electrical components will be new, this is a hardwired sconce. 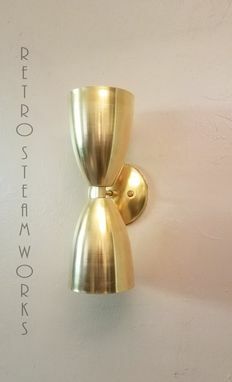 This sconce can be installed either in ceilings or walls. Plug-in option with inline switch (12" cord) is available through drop-down menu. The light bulbs are not included (it uses E26 bulbs). Replacements available upon request. This sconce can be done in several different configurations and finishes, contact me for customization info and pricing. Special pricing on more than 5 pieces. Contact me if you have any questions or shipping inquiries. SHIPPING NOTE: Sh&H cost is calculated by the size of the package, many times the cost will be lower. I will refund any shipping overcharge exceeding $2.00, please feel free to request a shipping estimate. Any imperfections present on the lamp are inherent to the handmade nature of this light. *Pictures included in the listing have been enhanced for illustrative purposes. *Due to variations on computer monitor settings, the color of the lamp may vary from one computer to another. Note: As with any handmade item, this lamp should be handled with care, this will ensure many years of enjoyment. Every maker has a story. Be a part of Retro Steam Works's story by placing an order, leaving a review, and seeing your review appear here.